The Golden Globe Award is an American accolade bestowed by the 93 members of the Hollywood Foreign Press Association recognizing excellence in film and television, both domestic and foreign. The annual formal ceremony and dinner at which the awards are presented are a major part of the film industry's awards season, which culminates each year with the Academy Awards. 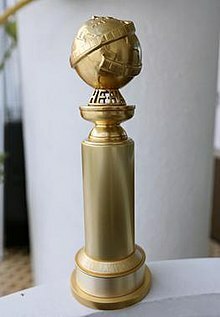 The 73rd Golden Globe Awards, honoring the best in film and television in 2015, were broadcast live on January 10, 2016. Ricky Gervais hosted the show for the fourth time.